Back at the beginning of the season folks were high on Dylan Floro, but we didn’t quite see why. After four very nice starts in a row, the Bulls winning three of them, maybe we’re starting to understand. He’s very efficient. He throws strikes and mostly lets the fielders do the work. He works very quickly (last night’s game was only a little over 2 hours). Will he do well in the majors? Hard to say. 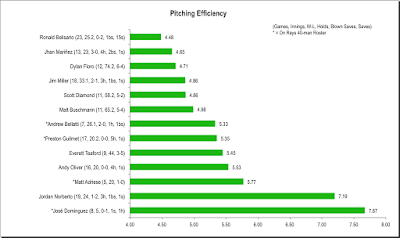 So much attention is paid to velocity these days that control guys like Floro can be overlooked. Maybe. Meanwhile, J.P. Arencibia continued his improving performance. Beginning to like the guy. The Rays are swapping out Enny Romero for Andrew Bellatti. Not sure when Bellatti will be back since players get more time to get back to the Bulls than they are allowed when going to the Rays. Long-time major league reliever Ernesto Frieri has accepted an assignment to Durham. Only 29, he is obviously looking to get back in to the form that saw some terrific seasons in 2010 to 2013. Stats. Reliever Kirby Yates had an inning as a starter down in Florida. Outfielder Mikie Mahtook got his second hit as a major leaguer, and his second home run. This is a home-grown stat that we like to keep track of. Very simple. How many pitches does it take to get an out? 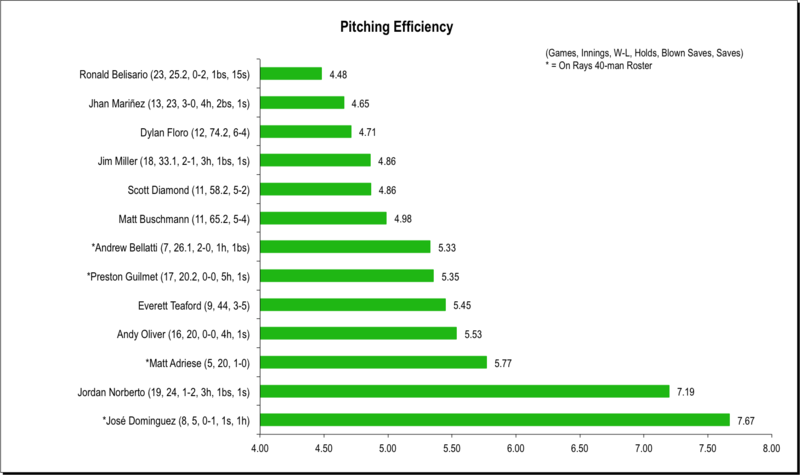 As mentioned earlier, Dylan Floro is a standout in this category, but most of the Bulls crew seem to be doing well by this measure.